Dialogue Contour - Using Dialogue Contour, you can reshape the intonation of dialogue to rescue or improve a performance in post production. 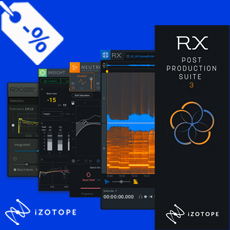 AudioSuite Plug-ins - Fix production audio without ever leaving your DAW (Pro Tools), saving time and money. AudioSuite Plug-ins Include: Dialogue Isolate, Derustle,Music Rebalance & Breath Control. Music Rebalance - Music Rebalance is a powerful tool that intelligently identifies vocals, bass, percussion, and other instruments in a mix and allows for independent gain adjustment of each element - you can even isolate or remove vocals.